Broco® Jimmy Pry Bar » Protective Solutions, Inc. The Broco 'Jimmy' is a personal tactical pry bar. 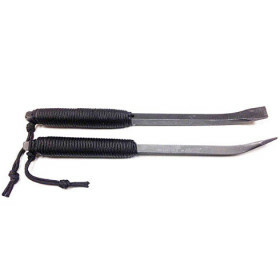 The 'Jimmy' is strong, made from heat-treated hardened steel. The cord-wrapped grip has a high density foam underlayment for comfort and dexterity. The 'Jimmy' is ideal for creating that first gap in a security door or gate to make way for a Halligan or other entry tool, and maintain the gap when other tools need to be reset. It can also be used to pry interior doors, force windows and transoms, lift flanges, break glass and punch holes.